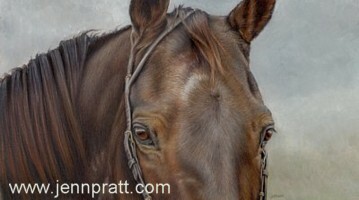 Ex Arte Equinus Juried Show | Jennifer Pratt Equine Artist. I just received my book of the Ex Arte Equinus International Equine art competition, containing 66 equine works from 57 artists. I was honoured to be accepted into the show. The above work, named ‘Billy was the work selected by the jurors. Billy was a commission piece I completed for my client, now friend Janice Zealand. Billy is a track horse, who ponies the young & fiesty thoroughbreds onto the track for their morning workouts. For the client and I, this image captured his wise character and the ‘story’ in his eyes leads one to believe that he passes his ‘words of wisdom’ to all the young race hopefuls he encounters. The book is beautifully put together and the equine artwork is of the highest calabre. I strongly recommend anyone with a passion for equine art purchase a copy.